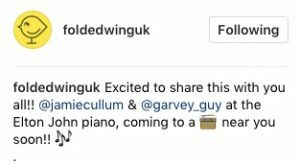 HomeJamie Cullum NewsWonderful, Magical and Musical Things To Come….. Wonderful, Magical and Musical Things To Come…..
As the title of this post suggests, we are expecting some wonderful things to come from Jamie….. These are the official updates announced this week. I love Elbow & Guy Garvey – a collaboration with these two would sound awesome!! I mean Guy Garvey did write “One Day Like This”.